Politics: Obama Condemns Libya Attack, Romney Says Administration "Disgraceful"
Obama Condemns Libya Attack, Romney Says Administration "Disgraceful"
WASHINGTON, D.C. -- Yesterday, four Americans were killed after an attack on the U.S. diplomatic post in Benghazi, Libya. Ambassador Chris Stevens and Foreign Service Officer Sean Smith were among those killed. The other two names are being withheld pending next-of-kin notification. This morning, President Obama condemned that attack, which he called "outrageous and shocking" in a statement from the Rose Garden. "We're working with the government of Libya to secure our diplomats," he said. "I've also directed my Administration to increase our security at diplomatic posts around the world. And make no mistake, we will work with the Libyan government to bring to justice the killers who attacked our people." Ambassador Stevens had a history of dedicated service in Libya, and as he spoke to reporters, the President described the work to which Stevens devoted his. 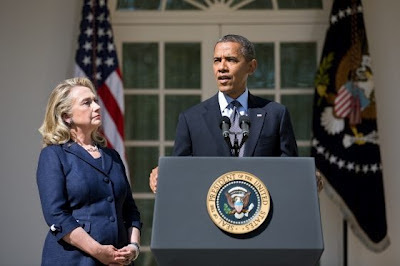 "At the height of the Libyan revolution, Chris led our diplomatic post in Benghazi," President Obama said. "With characteristic skill, courage, and resolve, he built partnerships with Libyan revolutionaries, and helped them as they planned to build a new Libya. When the Qaddafi regime came to an end, Chris was there to serve as our ambassador to the new Libya, and he worked tirelessly to support this young democracy, and I think both Secretary Clinton and I relied deeply on his knowledge of the situation on the ground there." As the President spoke, Secretary of State Hillary Clinton was standing by his side. Afterward, the two left the White House to visit the State Department, where the President planned to reiterate again his solidarity with America's diplomats stationed around the world. President Obama has also issued a proclamation ordering U.S. flags to be flown at half-staff to honor the victims of the attack in Libya. However, Mitt Romney was critical of the Obama Administration's handling of the attack last night. "I'm outraged by the attacks on American diplomatic missions in Libya and Egypt and by the death of an American consulate worker in Benghazi," said Romney in a statement. "It's disgraceful that the Obama Administration's first response was not to condemn attacks on our diplomatic missions, but to sympathize with those who waged the attacks.